We had a great meeting in the church last night. 10 people recieved Jesus!! I love to lead people to salvation. 97 % of Belgrade’s population are orthodox belivers but the majority of them claim that they are atheists. So in other words most of the people here are rekigious atheists.The Orthodox church are not so bothered about those that do not believe at all but rather bothered about people like my friends that are followers of Jesus. It is an ongoing persecution against born again and especially spiritfilled christians…even if they only are 4-500 in numbers. 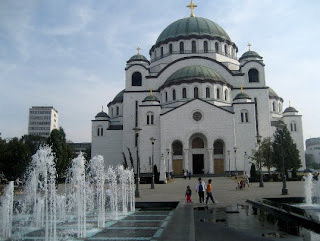 I believe God for a great breakthrough in Belgrade and Serbia. Millions of people here are lost and misled by a religious institution that have on interest alone….to control and to hinder the life of the Spirit of God to reach them. But nothing could stop Jesus walking out of the tomb!! !